The North West District Striking Competition at Wickham Skeith turned out to be yet another successful event with eight teams competing for the Ivings Shield on a warm-ish sunny afternoon. 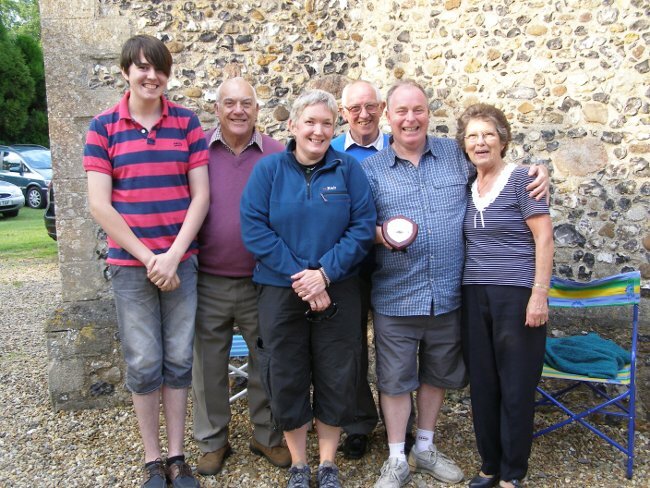 The Wickham Skeith ringers, with help from some of the Thornham Magna gang, put on a splendid barbecue which was obviously carefully planned and seamlessly executed. The judges, David and Katharine Salter, gave some very thoughtful and encouraging comments, and pointed out the value of striking competitions in setting a standard we should all be aiming for. 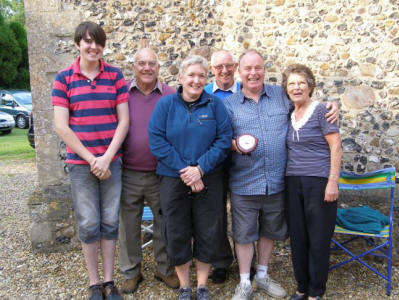 Last year's winners, the Young Ringers, were knocked off the top spot this year by an enthusiastic Norman Tower band and it was also good to see several bands ringing methods, when previously teams have only managed call changes. Thanks to everyone in the District who took part, to the hosts and to the judges. Keep practising for next year!